Image caption Tha Comhairle nan Eilean Siar ag amas gum bi 55% de chloinn na sgìre ann am foghlam tro mheadhan na Gàidhlig. Chualas gu bheil dìth luchd-teagaisg a nì cuspairean tro mheadhan na Gàidhlig anns an àrd-sgoil na chnap-starra do dh'amasan Comhairle nan Eilean Siar foghlam sa chànan a leasachadh. Chuala comhairlichean mun adhartas agus mu na dùbhlain ron ùghdarras aig coinneimh Dimàirt. Tha trì sgoiltean eile gu bhith a' faighinn inbhe Ghàidhlig - Baile a' Mhanaich, Siabost agus an Tairbeart - agus an àireamh chloinne a tha gan oideachadh sa chànan a' sìor-èirigh. Ach, tha obair mhòr fhathast romhpa a rèir ceannard an fhoghlaim, Uilleam Dòmhnallach. "San fharsainneachd tha an àireamh chloinne air a dhol suas 15% tro na h-Eileanan Siar, ach chan eil sinn air an t-amas againn fhèin a ruighinn buileach fhathast," thuirt e.
"Tha sinn ag amas air 55% den chloinn tro na h-Eileanan Siar a bhith ann am foghlam tro mheadhan na Gàidhlig. "Aig an ìre seo tha sinn aig mu 46%. "Ged nach eil sinn air an t-amas againn a choileanadh chan eil aithreachas oirnn gun do ghabh sinn amas cho àrd, airson tha mi a' smaoineachadh gu bheil e a' cumail ar n-inntinne air an targaid a th' againn, agus cumaidh sinn a' putadh gus an ruig sinn an ìre chloinne a tha sinn ag iarraidh a bhith ann am foghlam tro mheadhan na Gàidhlig. 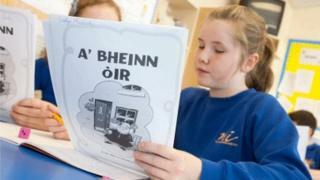 "'S e sin dìreach sa bhun-sgoil aig an ìre seo. Ach tha sinn cuideachd a' coimhead ri sia cuspairean san àrd-sgoil suas gu deireadh na treas bliadhna. "Ach chan eil sinn air an t-amas sin a choileanadh ach ann an Sgoil MhicNeacail a-mhàin, agus 's e an t-adhbhar airson sin dìreach gu bheil duilgheadas againn luchd-teagaisg fhaighinn san fharsainneachd - agus gu seachd àraid luchd-teagaisg le Gàidhlig. "Tha sinn a' feuchainn ris a' cheist sin fhuasgladh am-bliadhna. Tha cùrsa againn a' dol eadar Sgoil MhicNeacail agus Oilthigh na Gàidhealtachd 's nan Eilean, far a bheil còignear luchd-teagaisg againn a' trèanadh ann an Sgoil MhicNeacail am-bliadhna, 's bidh sinn an dòchas gum bi iadsan deiseil an ath-bhliadhna," thuirt e.
Tha a' Chomhairle cuideachd ag amas air inbhe Sgoil Ghàidhlig a thoirt do bharrachd sgoiltean sna h-Eileanan. "'S e 26 sgoil a th' againn, 's tha deichnear dhiubh aig a bheil inbhe a-niste mar sgoiltean Gàidhlig," thuirt Mgr Dòmhnallach. "Bidh sinn a' sùileachadh barrachd sgoiltean Gàidhlig a bhith a-staigh mar a dh'àrdaicheas sinn an àireamh chloinne a tha a' dol tro mheadhan na Gàidhlig. "Ach sa chiad dol-a-mach tha sinn airson an àireamh sin a thogail anns na sgoiltean eile, agus tha sinn ag obrachadh gu cruaidh air sin, ach tha obair ri dhèanamh fhathast," thuirt e.